The Bucks haven’t won a postseason series since 2001, but general manager Jon Horst believes this is the year the team breaks that streak, and potentially makes a much deeper playoff run, as he tells Sam Amick of The Athletic. “This is a time for us to take a step forward and to win a playoff series,” Horst said. “Even though people are sleeping on the Bucks, I think if we bowed out in the first round, everybody would be like, ‘What in the hell happened?’ Me included. That would be a disappointment. As Amick explores in his deep dive on the Bucks, the team has enjoyed the sort of camaraderie and chemistry this season that Horst believes can play a significant part in a club’s success. In Horst’s view, that sort of enthusiasm to come into work extends to all aspects of the organization in Milwaukee, rather than just the 15 players on the NBA roster. During the Cavaliers‘ four-year run as Eastern champs, they ultimately gave up on Joe Harris, who has since evolved into an important contributor in Brooklyn. Now that they’re in the midst of a rebuild themselves, the Cavs are looking to find “value in the margins” by identifying players like Harris, who may slip through the cracks elsewhere, writes Jason Lloyd of The Athletic. Count Sixers head coach Brett Brown among those who believe in Jim Boylen‘s ability to lead the Bulls. Before his 76ers fell to Boylen’s squad on Wednesday night, Brown praised the Bulls’ head coach for getting the most out of his players, calling him the right person to “help steer this program” through its rebuild (link via Mark Strotman of NBC Sports Chicago). While Boylen took over for Fred Hoiberg during the season, he’s expected to return as Chicago’s coach next season. MARCH 3, 6:10pm: Gasol has officially signed with the Bucks, according to a team press release. MARCH 3, 4:30pm: Gasol has officially cleared waivers, Bobby Marks of ESPN tweets. San Antonio will have a $15.92MM cap hit this season and $5.07MM in 2019/20, Marks adds. MARCH 2, 10:12am: Gasol gave back $2.5MM in salary as part of his buyout with the Spurs, tweets Shams Charania of The Athletic. The move will allow San Antonio to lower their salary cap hit for Gasol for both this season and next. MARCH 1, 5:32pm: The Spurs and Gasol have officially finalized the big man’s buyout, the team announced in a press release. MARCH 1, 3:46pm: The Spurs and Pau Gasol have reached an agreement on a contract buyout, which will clear the way for the veteran big man to reach free agency and join a new team, sources tell ESPN’s Adrian Wojnarowski. 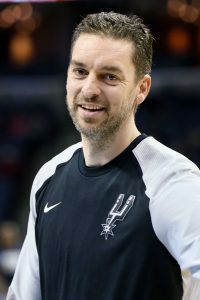 March 1 is the last day that a player can be waived by one team and retain his postseason eligibility for another club, so San Antonio figures to finalize the move before the end of the day in order to give Gasol the opportunity to participate in the playoffs for his new team. That new team will be the Bucks, as Gasol intends to sign with Milwaukee once he clears waivers, Wojnarowski reports. The Bucks had been on the lookout for one more frontcourt player, having been linked to Marcin Gortat earlier today. Gasol, whom we identified as a potential buyout candidate in February, has appeared in just 27 games and averaged a career-low 12.2 minutes per contest in San Antonio this season. Limited by injury issues early on, the 38-year-old hadn’t been a regular part of the team’s rotation even after getting healthy, as LaMarcus Aldridge, Davis Bertans, and Jakob Poeltl handled the majority of the minutes up front. While Gasol’s scoring numbers are way down, he has still been effective in other aspects of the game on a per-minute basis in 2018/19 — his 13.9 rebounds and 5.5 assists per 36 minutes are both career bests. Gasol is unlikely to play a major role in Milwaukee, but he could be an important insurance policy off the bench – particularly in the postseason – on a roster that doesn’t feature many traditional bigs. Joining the top-seeded Bucks could also give Gasol the chance to match up with his brother in the postseason — Marc Gasol is, of course, a member of the Raptors, the East’s No. 2 seed. Although the Bucks currently have a full 15-man roster, one of those players – Isaiah Canaan – is on a 10-day contract, so he’s the likeliest candidate to be the odd man out when Milwaukee officially signs Gasol. The exact terms of Gasol’s buyout with the Spurs aren’t yet known, but in addition to the prorated amount remaining on his $16.8MM salary for 2018/19, he had also been owed a $6.7MM partial guarantee on next year’s salary. San Antonio figures to slightly reduce that cap charge for 2019/20 as part of the buyout agreement, ESPN’s Bobby Marks notes (via Twitter). Marks also observes that, unlike J.R. Smith‘s contract, Gasol’s deal was signed under the current CBA and would have been subject to the new trade rules for non-guaranteed salaries in the offseason. That means the Spurs could only have counted the guaranteed portion of his deal ($6.7MM) rather than the full amount ($16MM) for salary-matching purposes if they had tried to deal him this summer, significantly limiting his appeal as a trade chip. That’s likely one reason why the Spurs didn’t feel the need to hang onto him. Whispers that the Spurs were making Pau Gasol available in trades prior to the deadline circulated and it’s possible that the big man had requested the team search for a suitor. Last week, an ESPN Deportes report suggested as much, but Gasol disputed that rumor today. The report did not cite a source, instead simply stating (translation from Spanish) that Gasol had asked the team for a trade. The 38-year-old did admit that the current situation is not what he expected it would be. The Spurs re-signed the Spaniard to a three-year, $48MM deal back in the summer of 2017 with visions of continuing the Gasol-LaMarcus Aldridge pairing. However, this season, Gasol has struggled to find a consistent role. In his 26 games played, he has played no more than nine minutes in 10 of them, while seeing 20 minutes or more on just three occasions. Only $6.7MM of Gasol’s roughly $16MM salary for the 2019/20 campaign is guaranteed and Orsborn writes that the Spurs have looked at ways to “rid themselves” of what’s left on the big man’s deal. Could that be via a buyout? Gasol was asked about the possibility. No one seems convinced that the Bucks are a viable suitor for Anthony Davis, given their dearth of first-round picks and the fact that most of their best players are on expiring contracts. However, co-owner Marc Lasry is still encouraged by the fact that Davis’ four-team list of preferred destinations includes Milwaukee, as he tells Sporting News’ Mitch Lawrence. Lasry, who may be bordering on tampering territory with his comments to Lawrence, acknowledged that it would be tricky for the Bucks to make a deal for Davis using the club’s current assets. The Sixers are another team interested in Mirotic and have offered the Pelicans a pair of second-round picks for him, per Lawrence. For salary-matching purposes, Wilson Chandler would likely have to be involved in any 76ers deal for Mirotic. Philadelphia has also looked at Terrence Ross (Magic) and Wesley Matthews (Knicks), Lawrence notes. An Eastern Conference GM tells Lawrence that the Spurs are making an effort to move Pau Gasol. Gasol is on a pseudo-expiring contract, as only $6.7MM of his 2019/20 salary is guaranteed. Lawrence suggests that the trade market for Grizzlies big man Marc Gasol may be negatively impacted by Gasol’s desire to get a contract extension this summer. If he doesn’t feel as if he’ll get a lucrative multiyear deal in the offseason, the 34-year-old could pick up his $25.6MM player option. While the Spurs typically aren’t too active on the trade market during the season, they’ve inquired about possible targets on the wing over the last few months, league sources tell Jabari Young of The Athletic. According to Young, San Antonio had interest in Trevor Ariza but couldn’t put together a package that would work before he was sent from Phoenix to D.C.
Young isn’t 100% sure that the Spurs remain in the market for a wing, but identifies Pistons forward Stanley Johnson as one player who could be on the team’s radar. As Young points out, Spurs assistant GM Brian Wright was part of Detroit’s front office in 2015 when the Pistons drafted Johnson eighth overall, and is believed to still be a big fan of the 22-year-old. The 20-26 Pistons are tied for ninth in the Eastern Conference and may not be overly interested in moving Johnson as long as they remain in the hunt for a postseason spot. However, if Detroit considers moving the RFA-to-be, the club could seek a protected first-round pick or a pair of second-rounders, says Young. With only a few months left on Johnson’s contract and the Spurs viewed as a difficult trade partner with whom to negotiate, a trade may be a long shot, Young notes. Nonetheless, it’s a situation worth keeping an eye on as February 7 approaches. Pau Gasol looks like one of the more obvious trade candidates on the Spurs’ roster, but a league executive tells Young, “I just don’t see him having any trade value.” Gasol has played limited minutes since returning from a foot injury that sidelined him for a good chunk of the season. Mavericks coach Rick Carlisle is willing to welcome Dennis Smith Jr. back to the team whenever he’s ready, relays Tim MacMahon of ESPN. Smith hasn’t played in the past four games — officially because of back soreness and an illness — and didn’t join the Mavs for their current road trip. He also didn’t report for Friday’s practice. Sources told MacMahon that Smith is frustrated over changes to his role on the team with the arrival of Luka Doncic, but the Mavericks remain hopeful for a reconciliation. Smith’s agent, Glenn Schwartzman, didn’t return text messages and phone calls seeking a comment. Carlisle said he also reached out to Smith and Schwartzman. Mavericks guard J.J. Barea expects to be out of action for six to nine months after surgery to fix a torn right Achilles tendon, tweets Dwain Price of Mavs.com. The 34-year-old, who suffered the injury last week, will be a free agent this summer. Pau Gasol has been back in the Spurs‘ starting lineup in four of the past five games, but the move hasn’t resulted in more playing time, notes Tom Orsborn of The San Antonio Express News. He has averaged just 11 minutes per game during that stretch. “At this point, I’m just doing my best with the opportunity and the conditions I am playing under,” Gasol said. The Rockets‘ backcourt, already depleted by Chris Paul‘s hamstring injury, may be even more shorthanded after Eric Gordon limped off the court late in last night’s win at New Orleans. Gordon will undergo an MRI today to determine the severity of a bruised right knee, tweets ESPN’s Adrian Wojnarowski. Gordon tells Jonathan Feigen of The Houston Chronicle that he banged knees with someone early on and the pain increased throughout the game. Rumors that the Mavericks are looking to trade second-year guard Dennis Smith Jr. are way overblown, announcer Chuck Cooperstein said in a radio interview excepted by The Dallas Morning News. Marc Stein of The New York Times recently reported that executives around the league expect Smith to eventually be moved because of the emergence of rookie Luka Doncic, but Cooperstein stressed that the story never indicated Dallas is actively looking for a deal.